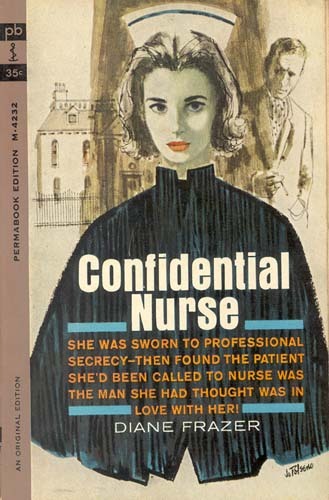 She was sworn to professional secrecy — then found the patient she’d been called to nurse was the man she had thought was in love with her! Linn looked over at the man in the bed. He was lying with his face turned to the wall. He was asleep, she thought, or in pain, because he did not turn his head when they came in. Linn stood beside Dr. Jacoby, leaned forward and held out her hand. On her face was the smile of welcome, of cheer, the smile that was automatic. The man lying there turned his head. Linn stood with her hand still out-stretched, the smile frozen on her lips. She stood paralyzed for the eternity of a moment, aware of Dr. Jacoby’s startled look. The man in the bed was Ronald Adair!